Sweet Mother’s Kitchen is a recipe sharing blog written and edited by Charlotte Mwagbe. For questions about this affiliate disclosure or my blog, please click here to contact me. The purpose of Sweet Mother’s Kitchen is to help people find and share recipes that have been handed down in families from one generation to the next. Many of these types of recipes (soul food/comfort food/southern food/country food) have not been formally documented by written recipe. Here at Sweet Mother’s Kitchen, we are attempting to share in that process by encouraging the sharing of recipes, an act which requires documentation to achieve. It does take time to create all this content, so I do accept paid advertising, sponsorships, affiliate programs and other forms of compensation. Any/all of the links on sweetmotherskitchen.com are affiliate links. This means that if you click on the link and buy certain items, I will receive a small commission. The price is the same for you, though and doesn’t cost you one penny more! Thank you for your support! I may sometimes review items that are sent to me for free. All of my opinions regarding them are my own. I only endorse products that are in alignment with my ideals and that I believe would be of value to my readers. If a post is sponsored by a company, I will disclose that within the post. I am very picky about what I recommend, and that holds true for sponsored posts. If it’s not something I would use or recommend to my family, I won’t recommend it to you. I am not an affiliate of any product or service that I do not trust for use in my businesses. If I don’t use it, I do not promote it. This is the only way I can ensure product quality, service and support levels, which are so important to those who trust my recommendations. 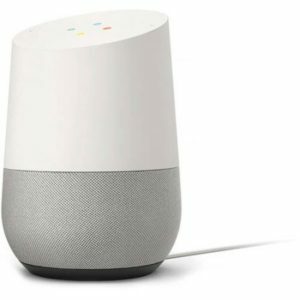 The link below for the Google Home is an affiliate link. That means if you click and buy I will make a small commission for referring you but it won’t cost you a penny more! I only refer you to products I love and I think you know how I feel about the Google Home – LOVE!!! When you’re in the kitchen cooking do you like to have some great music playing? What I like to call, “music to jam or make jam by”? 🙂 For me cooking and cleaning while listening to music go hand in hand! I love to put on my favorite Gospel and old school R & B music while I’m working and if you do too I’ve got some great news for you! One of the biggest problems with kitchen work and music is having to use your hands to change the song, advance the playlist, change artists, turn it down when the phone rings and back up when you’re finished with the call! It always seems you need to touch your music source when you have something all over your hands – never when they’re clean and dry! Well, Google Home solves those problems and so many more! Google Home is a voice activated speaker for your home that operates on “smart” technology! No hands required to play a song, change a song or skip a song! All you have to do is say, “Hey Google” and then tell it what you want to hear! Like “Hey Google play I Want You Back by The Jackson Five” or “Hey Google, play Distant Lovers by Marvin Gaye”. Hey Google, play “I’II Call Your Name by Switch”! You’ll hear “Ok, playing I’ll Call Your Name by Switch on YouTube- etc. Hands free music selection! YES!!! Google Home is especially when you’re cooking, baking and doing your thing in the kitchen because you’ve always got something in or on your hands! What a pleasure to be able to play my music with a shout out and without having to touch anything! I can even tell Google Home to turn the volume up or down, turn the music off, pause or resume!!! 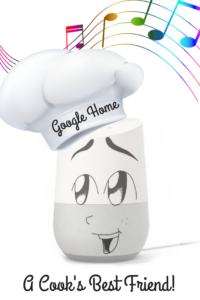 As a cook I think Google Home is the best thing since sliced bread! This little dynamo is a game changer! I’m a big fan of old school R & B and I got to listen to whatever song came to my mind! It was as simple as saying, “Hey Google, play…” And remember, this works with any type of music that you want to hear, any song, any genre, any artist! If it’s on the internet, Google Home finds it immediately and plays it for you! It plays music from various sources like Spotify, Google Play Music, Pandora, YouTube, iHeart Radio and more! Google Home even corrected my request a couple of times and played the right song even though I requested it wrong! Once or twice I said the wrong name of the song or paired the song with the wrong artist. Google Home corrected my request and played the song I wanted to hear! So Cool! Google Home comes in a variety of one of 3 base colors, with an option to buy one of 6 additional colors in two finishes – fabric or metal, which you choose to match or coordinate with your home or room interior design. With Google Home you can ask it questions about the weather, traffic, sports scores, have it interact with your home system and turn on and off your TV and other appliances and lighting. It can play your exercise video or turn down the thermostat. Also, coming soon – hands free calling! Can’t wait! Before I forget, I got a chance to share time with family visiting from out of town this past weekend. My first cousin Dee and her husband Melvin and my cousins Ronni and Darlene came for a four day weekend and it was so much fun! I cooked up a ton of food and we ate, sang, talked and had a great time together! I took Google Home with me to the hotel and set it up in Dee’s & Melvin’s room. Google Home was right in the middle of it all, actually helping to make the magic happen! After the weekend was over, I took GH back home on the last night. I plugged it in and as a test to see if it would turn itself off, I said “Hey Google, Goodnight”! Well – it didn’t turn itself off, but it did say, “Goodnight, sleep tight, don’t let the bedbugs bite, but if they do, I’ll help you find an exterminator”! What!!!??? Now that’s what I call smart technology! Priceless! Tired of being left out in the cold when it comes to putting your food photos on your blog or social media sites? Well, now you’ve got some real help! Lindsay from “Pinch Of Yum” and “Food Blogger Pro” has put together the Tasty Food Photography ebook! It’s full of food photography tips, techniques and tricks to help take your blog to another level! In The Tasty Food Photography ebook, Lindsay teaches tips on lighting, composition, props, set-up, editing and more! Learn to take photos that make people’s mouths water! Lindsay knows the ins and outs of food photography because she and her husband Bjork, grew their two businesses on their own from the ground up. You’ll be learning photography from someone who has done it, lived it, figured it out and taken her own blog to where you probably want to take yours – over 70,000 page views daily! As a student of Lindsey’s food photo classes on Food Blogger Pro, I can say that she knows her stuff! Join 8,900 other people and kick your food photography up a notch (or 10) with The Tasty Food Photography ebook! I love deer meat sausage! Wild game is one of the primary foundations of soul food. Back in the day the slaves were given the discards of the food, not the prime rib! We had to hunt, trap, kill, clean, dress and cook our own food. I remember when I was a child my dad always went hunting and it was rare for him to return bare-handed. One of my earliest memories of butchering an animal is being taught how to skin, gut and prep a rabbit for the pot! Today, there’s a fast food restaurant on every corner and a grocery store not too far away. For many people this means, no longer is it necessary to hunt your own food. In fact, many hunters today, do so for sport only which I do not agree with. If you’re not going to eat it, don’t kill it. Killing for sport is wasteful and selfish. I happen to live in a state that has loads of wildlife that is permitted for hunting. We have pheasant, wild turkeys and other small game that has permitted seasons for hunting. One of my favorite meats lately is deer meat or venison. You can buy venison in some specialty stores and online but I have friends who hunt, so for the price of a tag (license) if they get an extra one, it’s mine! It’s a real bargain to get about 20 pounds of deer meat for the price of a $6 tag and $55 meat processing fee. Deer meat is super lean so you can eat it on a diet, which I do. I especially like the tenderloin which is what we get when our deer is processed. Deer roast, tenderloin, sweet Italian sausage, hot Italian sausage, pepper sticks (like a Slim Jim) and ground deer are what we get. The sausage and pepper sticks is a little extra but worth it! This year, I started making my own deer sausage and I’m very happy with the results! I thought you may enjoy giving it a try, so I’m including my deer sausage recipe for you. 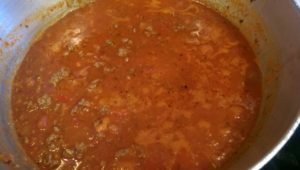 The way I like to use it is to brown the seasoned meat and then to combine it with tomato sauce and spices and make a pasta sauce out of it – simply delicious!!! TIP: As I said, deer meat is super lean so to make a true deer sausage, you have to add fat. The easiest way I have found to do that is to do a 50-50 mix with one pound of ground deer and one pound of ground pork. When my dad taught me how to make gravy, I was probably about 13 or so. I had been cooking for a while by that time, I’m sure I had made gravy before, but my dad taught me how to make graving by starting with a roux. The important thing though is that he did teach me by starting with flour and grease (we never said oil back then). Daddy never told me that his way of making gravy was called a roux. I didn’t really learn about the complexities of a roux until I went to culinary school, years later. Since culinary school, I can say I no longer make my roux with flour and grease, even though back in the day when Daddy was teaching me, the grease was mainly bacon grease – so, y.u.m.m.y!!! Today, I use roux for different reasons and in different applications. Sometimes for gravy, sometimes for sauce, it depends on what I’m making. Something else I learned in culinary school was that roux comes in a variety of colors. There are blond rouxs, brown rouxs, red rouxs and black rouxs. The darker the roux, the more intense the flavor! I use a light or blond roux if I’m making the gravy for creamed chicken or chicken pot pie. 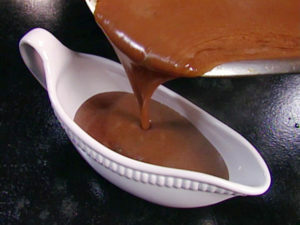 I use a medium to dark roux for brown gravy or if I’m making gumbo. Different color rouxs for different dishes. This is the recipe for a basic roux. The longer you allow it to brown, the more intense the flavor and the darker the color. But be careful not to burn it, and yes there is a difference that you can taste! Melt butter on stove top using a 4 quart sauce pan or large cast iron skillet, using a medium heat. Once the butter has melted, turn the flame down to medium low. Add flour and stir until it reaches the consistency of peanut butter. Brown roux to the desired shade. When preferred color is reached, add liquid to the roux. I usually prefer to use broth but you can use your choice of liquid, including water, milk, juice and stock. Once you master making roux, it will be your “go to” choice for thickening soups, sauces and gravies. Quick Tip: One of my chef instructors taught us to make a batch of roux to keep near the stove to use as needed, instead of starting a roux from scratch every time we needed to thicken a dish. I tend to do this when I’m working on a big meal and I have many dishes that will need thickened, gravy to be made etc. Make a batch of blond or light to medium brown roux. When it reaches the color you want, remove it from the heat and keep in a covered container near the stove. If you have any left over that you won’t use for a while, you can keep it in the refrigerator until you need to use it. I’ve known for years that Patti LaBelle loves to cook and that Sis Patti’s mac and cheese was something that even the rich and famous rave about! While putting this soul food recipe sharing web site together, I decided to add a category for celebrity chefs – famous and not so famous! I will upload the best recipes I can find from our beloved celebrities. The first celebrity is Sister Patti and her famous mac & cheese. For Sis. Patti’s mac & cheese recipe, we’ll go to her website and get the recipe straight from the source! Enjoy! Makes about 1 cup of mayonnaise, we usually double it to have enough to also spread on the bread. Place all ingredients in food processor (or blender), reserving ¾ cup oil. Add remaining oil slowly while processing. (We use the metal blade on the processor.) As I have said, my processor is old, but the tool to push food in the processor has a tiny hole to allow air in. (I don't know if they all do.) My sister-in-law, Libby Griffin discovered this trick while learning to make Lella's mayonnaise. If you put the pusher in the opening and pour your oil in the pusher--it allows a tiny constant stream of oil to be added to the mayonnaise while you are processing. Using this method, we never have the mayonnaise separate. Please understand, Lella was an old-timey cook. She didn't often use measurements (usually the only time was when she was baking) so that is why the recipe reads as it does. If you consider it I will try to work on some measurements if you deem them necessary. In 2003, the Southern Foodways Alliance held a Pimento Cheese Invitational, and this is the recipe that topped the other 300 entrants, courtesy of Oxford’s Nan Davis’ Aunt Lella. Pimento cheese with homemade mayo is the bomb! I found this recipe when I lived in Atlanta a few years ago. I was online searching for a good pimento cheese recipe and I found this one on the Southern Foodways website. It was when the site still had stories all over it about everything. It was so quaint, engaging and southern! I just loved that format! Today the site’s a bit different and I can no longer find the pimento cheese recipe on it. But not to fear, it’s available online if you know how to look for it – and it still tastes the same! YUM! The recipe is great and the story behind it is even better! I’ll let you see for yourself and I will include the recipe in it’s entirety – including the story. 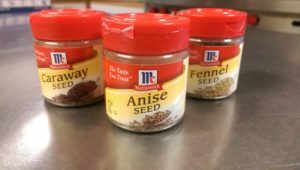 I especially like the way the recipe tells you to add a pinch of this or a dash of that. This helps make your batch your own because what is a pinch or a dash to you may be different for me. Also, it doesn’t say how much of the homemade mayo to use so I use most of it, but I keep a little extra on the side for cold leftover turkey sandwiches – it’s really good mayo! To Nan and Aunt Lella, thanks for sharing, we appreciate you both! Photo to follow the next time I make this delicious pimento cheese. It’s total yum! This is one of my favorite salads and as far as I know, my Aunt Winnie created this recipe! Aunt Winnie loved shrimp and she filled this salad with a pound of more of them in addition to the crab claw meat. This salad holds its own against ribs, ham, turkey and other "attention grabbing" entrees! Soul Good!!! Mix all ingredients together in a 5 quart mixing bowl. Refrigerate at least 3 hours. 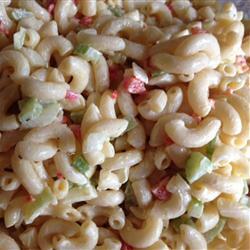 Macaroni seafood salad with shrimp and crabmeat was one my favorite dishes that my Aunt Winnie used to make! My Aunt Winnie was a phenomenal cook and my second greatest cooking influence after my Mom. I loved this dish even though I grew up with my Mom’s macaroni (and potato) salad and boy were they delicious! But adding the seafood to the dish elevated it to another level. No you should not use imitation crab meat, and no you should not use cocktail shrimp. The reason is because the taste would be affected. You do want to use pasturized crab claw meat – or – crack snow crab legs and use that. I buy medium shrimp that I shell, devein and poach them till they pink and translucent. You can use your favorite pasta salad recipe and jazz it up with seafood! A little creamy, crunchy and filled with sweet seafood! Yum! Tired of spinach dip? Check this warm turnip green dip out! The first time I tasted this dip I was in a restaurant in Atlanta and we ordered it from the appetizer menu. I'm the girl who eats something in a restaurant and goes home and recreates it - so this is my version but everyone who eats it loves it! Not only different but so delicious it may become your new "go to" dip recipe like it is mine! Oh - by the way, you can make this without cooking the greens, just use frozen chopped turnip greens instead of canned. Enjoy! Sauté garlic in hot drippings 1 to 2 minutes (be careful not to burn). Add reserved greens juice and cook another 1 to 2 minutes, stirring to loosen particles from bottom of pan. Chop and stir in drained turnip greens, cream cheese, sour cream, onion, chicken base, pepper flakes and ¼ cup of parmesan and 2 Tbsp. asiago cheese. Cook, stirring until cream cheese melts and mixture is thoroughly heated (8-10 minutes). Lightly coat a 2qt baking dish with canola or olive oil spray and transfer dip to dish. Sprinkle with remaining ¼ cup of parmesan and 2 Tbsp. 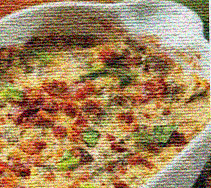 asiago cheese and broil dip 6 inches from heat 4 to 5 minutes or until cheese is lightly browned. Sprinkle with crumbled bacon or ham cubes. Toss pita wedges in butter, garlic powder and parsley flakes mixture to coat. Bake 10-12 minutes until lightly toasted. Serve warm with warm turnip green dip. This warm turnip green dip recipe is inspired by a dish that I ate at a restaurant in Stone Mountain, GA when I lived there. The restaurant was called Mama’nems, it was located on Memorial Drive and it specialized in – you guessed it, soul food! The restaurant is now closed and from the reviews I read online, I think the warm turnip green dip was a wise choice! Anyway, I loved it so I did a little research and came up with my own recipe! Enjoy! Note: If turnip greens aren’t your cup o’ tea, feel free to sub your favorite greens. Kale should work with no problem but – be adventurous and let us all check out your recipe! This orange dream cake is not only good, it’s super easy! My mother made her cakes from box cake mixes, 99% of the time. She was too busy working and raising kids to do everything from scratch, so she chose her battles – and desserts were where she used a lot of tips and tricks, which I’ll share with you. Even though Mommy made box cakes, they were never based on the recipe on the back of the cake box. She always “doctored it up” as she called it. The doctoring must be the trick cause her cakes were hugh successes all around! Simple, easy and delicious! Just like my Mom’s cakes, this orange dream cake will be a big hit with your family, it tastes just like a dreamsicle! This photo and recipe are the property of The Blue Rooster Bake Shop in Lawrenceville, GA! I worked for the Blue Roo as an intern during culinary school and as my first “food industry” job! I loved the owners Kyle and Doug Wright, their family and the people I worked with! If you’re in Lawrenceville, stop by and tell Kyle “hi” for me – and make sure you have something to eat! Everything’s awesome! 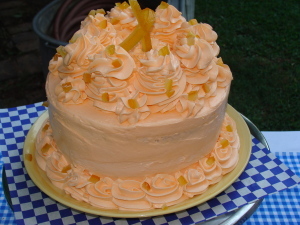 The cake in the photo is decorated with candied orange rind that I had on hand when I worked at the Blue Rooster Café in Lilburn, GA where the photo was taken. My recipe is also a modified version of the one we used at the Blue Roo! Mix butter and shortening together. Add remaining ingredients. Voila! Perfect buttercream icing! Spray two 8" or 9" round cake pans with Bakers Ease, flour and shortening mixture - or grease with shortening and flour. (Use baking cups for cupcakes). Mix, water, oil and eggs in large bowl at low speed until moistened. Beat at medium speed for 2-3 minutes. Pour into prepared cake pans. Bake 30 minutes. Check for doneness by pressing lightly on cake surface. It should spring back. Also check by inserting toothpick in center. It is done if it comes out clean with no batter or crumbs clinging to toothpick. Cool cake in pan on wire rack for 15 minutes. Remove from pan and cool completely before frosting. Ice cake and decorate as desired.